Our anti aging products are specifically designed for mature skin whether it is dry, extra sensitive, acne prone, normal or sun damaged. For best results, we recommend finding a skin care professional that can help determine what anti aging products and daily regimens work best for your skin. 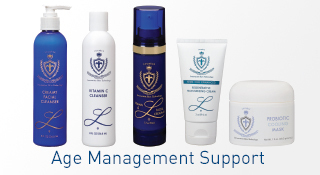 If you are a skin care professional and would like to inquire about the LPAR Skin Care line please visit our Retailer page. 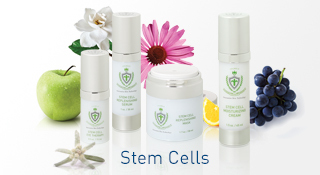 Plant stem cells represent a major breakthrough in skin care, launching the beginning of a new system of treating the skin...by protecting and replenishing the building blocks of what makes up our own skin: Stem Cells. Rather than working around the natural aging process of our skin stem cells, we now have the technology available to improve the life of our skins most important and central component. 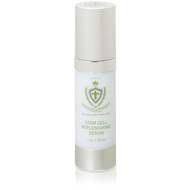 Featuring a potent dose of apple and edelweiss plant stem cells, state-of-the-art peptides, and other cutting edge ingredients, the Stem Cell Replenishing Serum is thoroughly formulated to produce age defying results, restoring the youthful look and vitality to aging skin. For mature skin types, apply once or twice daily to clean, dry skin. Avoid the eye are by at least 1 cm while applying. 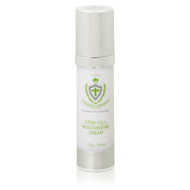 Featuring a healthy dose of apple stem cells (malus domestica), peptides, and numerous botanical extracts, the Stem Cell Moisturizing Cream is formulated to produce age defying results, while also helping to maintain healthy and youthful looking skin as a daily moisturizer. 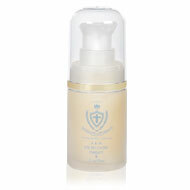 For mature skin and/or skin conditioning, apply once per morning, on clean, dry skin. Avoid the eye are by at least 1 cm while applying. 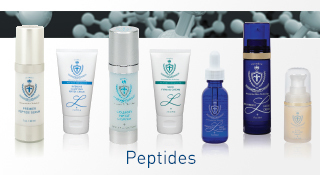 Originally, peptides (mostly found in Argireline & Matrixyl) became a tremendous success as studies continued to show that they were not only more effective for fighting wrinkles and stimulating the skin’s natural collagen, but that peptides exposed the skin to far less trauma than retinols or glycolic acid. As peptide technology continues to revolutionize skin care, we’re taking advantage of every opportunity to ensure our clients have access to the most advanced, result-oriented anti-aging products available. Originally designed to prepare and increase the skins receptiveness to our Professional Peptide Peel, the Premier Peptide Serum has gone on to become our most powerful anti-wrinkle product for year-round home care due to its high concentration and diversity of peptides. Composed of a total concentration of 65% peptides, the Premier Peptide Serum is a state of the art facial serum expertly formulated to reduce the signs of aging, energizing mature skin. The Intensive Clarifying Peptide Cream is a unique and high potency moisturizing cream formulated with an abundance of natural skin lighteners, peptides, and botanical extracts that combine to clarify and firm mature skin, while effectively minimizing fine lines and wrinkles. The Collagen Peptide Complex builds off of our original Collagen Copper Activating Complex, and includes an advanced formulation of peptides, including Syn-Coll®, a small but powerful peptide that stimulates collagen synthesis at a cellular level, helping to compensate for any collagen deficit in the skin. Boasting a remarkable collection of natural and innovative ingredients from exotic plants and enhanced peptides, the neck firming cream has been designed & tested to firm and energize mature skin, while providing increased smoothness and elasticity to the often neglected neck area. Designed for mature skin, this sophisticated moisturizer promotes cell renewal, stimulating the dermis layer of the skin with a high potency blend of peptides (Argireline®, Matrixyl®, & Biopeptide-CLTM) and botanical extracts that make it a particularly refined and effective moisturizing cream for age management. The A&M Eye Recovery Therapy is an advanced age management treatment, applying the most tried and true peptides and delivery systems; Argireline® & Matrixyl®, to the highly wrinkle prone and fragile eye area, providing diminished wrinkle depth, and increased firmness and elasticity. The peptide Eyeliss™ is added to further enhance this treatment by counteracting skin slackening, puffiness, and decreasing irritation. The A&M Facial Recovery Therapy is an advanced age-management treatment that blends the most tried and true peptides and delivery systems; Argireline® & Matrixyl®. Stimulating the deeper layers of the skin, the A&M Facial Recovery Therapy provides diminished wrinkle depth, as well as an increase in skin elasticity and firmness. For mature skin types; apply at least three weeks before beginning the Lucrece Professional Peptide Peel treatment, and use twice a day leading up to the Peel. For year round application, apply once per day after the Collagen Peptide Complex. Avoid the eye area by at least 1 cm during application. SYN-AKE®: A small peptide (Dipeptide Diaminobutyroyl Benzylamide Diacetate) that mimics the activity of Waglerin 1, a polypeptide that is found in the venom of the Temple Viper, Tropidolaemus wagleri. Clinical trials have shown SYN-AKE is capable of reducing wrinkle depth by inhibiting muscle contractions. SNAP-8™: An anti-wrinkle (Acetyl Octapeptide-3) elongation of the famous Hexapeptide Argireline. The study of the basic biochemical mechanisms of anti-wrinkle activity led to the revolutionary Hexapeptide which has taken the cosmetic world by storm. This unique and high potency moisturizing cream is formulated with an abundance of natural skin lighteners, peptides, and botanical extracts that combine to help clarify and energize mature skin. Smooth a pearl size drop onto the face, gently massaging in with fingertips once per day (morning), avoiding the eye area. Follow with solar protection if applicable. Mulberry Bark, Saxifrage Extract, Grape Extract, Scutellaria Root Extracts, Vitamin C Ester (Tetrahexyldecyl Ascorbate), Emblica Fruit Extract, Licorice Root Extract. Specializing in firming the skin, the Collagen Peptide Complex builds off of our original Collagen Copper Activating Complex, and adds a combination of (5) major peptides, helping to keep the skin looking its youngest and most alive, as it works to firm, and add elasticity & texture to the skin. 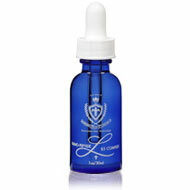 For best results, apply directly after the Nano-Peptide B5 Complex. Apply a liberal amount on clean, dry face using fingertips, and massage into the skin. Let dry, and follow with a moisturizer and sun-block if used during the day, or the Vitamin A Facial Cream + III if used at night. Warning: For mature skin only. If redness occurs, lessen use to once or twice per week. If reactions persist, discontinue use. On clean dry skin, apply onto the neck area with fingertips in an upward motion. Apply twice a day, or as needed. Bio-Bustyl®: Stimulates cell metabolism, promotes collagen synthesis, and enhances fibroblast (collagen-producing cell) proliferation. INCI: Glyceryl Polymethacrylate, Soy Protein Ferment, PEG-8, & Palmitoyl Oligopeptide Polylift®: Using a cross-linking technology, biopolymerization, Polylift reinforces the natural lifting effect of sweet almond proteins, providing a smooth firmness & radiance to the surface of the skin. INCI: Prunus Amygdalus Dulcis (Sweet Almond) Seed Extract. Hydration is the most essential way to keep our skin healthy feeling and healthy looking. While many of our products assist in hydrating the skin, hydration is the main focus for this product, making it an essential for all skin types. Fortified with Hyaluronic (30%) and Panthenol (Vitamin B5), the Nano-Peptide B5 Complex provides an especially deep and complete hydration. With the addition of peptides, it also assists in tightening and firming the skin while allowing for maximum absorption and effectiveness. The Nano-Peptide B5 Complex should be applied directly after cleansing the skin, as the 2nd step in skin care regimens for all skin types (morning & night). For best results, age management regimens should follow with the Stem Cell Replenishing Serum and/or the Collagen Peptide Complex before moisturizing. Apply a healthy amount on clean, dry skin. May be used around the eye area. Palmitoyl Pentapeptide-4: Stimulates the skins fibroblasts to rebuild the extra-cellular matrix, including the synthesis of Collagen I and Collagen IV, fibronectin and of Glycosaminoglycans. It also stimulates the production of the dermal matrix (Collagen I & III) resulting in a significant reduction of wrinkles and fine lines. Acetyl Hexapeptide-8: Reduces facial wrinkle depth and the signs of skin aging resulting from facial movements and facial muscle contraction by halting the release of neurotransmitters from SNARE and catecholamine complexes, (which can also induce formation of wrinkles and fine lines to the skin). Hyaluronic Acid (30%): Penetrates deep into the skin, providing ample moisture Panthenol: Enhances formation of skin pigments for younger looking skin, and contains deep penetrating properties that allow a more complete hydration. Water (Aqua), Hyaluronic Acid, Panthenol (Vitamin B5), MDI Complex, Palmitoyl Pentapeptide-4, Acetyl Hexapeptide-8, Phenoxyethanol, Hydrolyzed Wheat Protein, Butylene Glycol, Hydrocotyl & Coneflower Extract, Glycosaminoglycans. Designed for mature, sun damaged, and/or dehydrated skin, the Anti-Wrinkle Facial Cream is a peptide enriched moisturizer focused on increasing skin firmness & elasticity, and fortifying the skin with anti-oxidants & botanical extracts to facilitate healthy feeling and healthy looking skin. Smooth a pearl size drop onto the face, massage into skin thoroughly. For use in the morning (recommended), follow with solar protection. This advanced eye care treatment is expertly formulated to diminish the depth, increase firmness & elasticity, and to counteract skin slackening to the highly wrinkle prone and fragile eye area. Featuring (4) major peptides (Argireline, Matrixyl, Eyeliss, & Regu-age), the A&M Eye Recovery Therapy is our most potent eye treatment, and is recommended for mature skin. Using fingertips, massage to surrounding eye areas affected by wrinkles due to muscle contractions. Also use in the nasal labial area. For best results, apply once per evening, followed by the A&M Facial Recovery Therapy, and/or the Vitamin A Facial Cream + III. Palmitoyl Pentapeptide-4 (Matrixyl): Stimulates the skins fibroblasts to rebuild the extra-cellular matrix, including the synthesis of Collagen I and Collagen IV, fibronectin and of Glycosaminoglycans. It also stimulates the production of dermal matrix (Collagen I & III) resulting in a significant reduction of wrinkles and fine lines of the skin. Acetyl Hexapeptide-8 (Argireline): Reduces facial wrinkle depth and the signs of skin aging resulting from facial movements and facial muscle contraction by halting the release of neurotransmitters from SNARE and catecholamine complexes, (which can also induce formation of wrinkles and fine lines to the skin). Dipeptide-2 & Palmitoyl Tetrapeptide-7 (Eyeliss): Combats the effect of tiredness and hypertension, as well as the natural effects of aging, which contribute to the formation of bags under the eyes, Eyeliss is an outstanding anti-aging ingredient. Soy Peptides & Hydrolyzed Rice Bran Extract (Regu-Age): A highly active complex of specially purified soy and rice peptides and biotechnologically derived yeast protein, Regu-Age effectively addresses dark circles and puffiness around the eyes. An advanced age management treatment that blends the most tried and true peptides and delivery systems, Argireline & Matrixyl, helping to prevent skin aging induced by repeated facial movement caused by excessive catecholamine release. Stimulating the deeper layers of the skin, the A&M Facial Recovery Therapy provides diminished wrinkle depth, as well as an increase in the elasticity and firmness of the skin. Recommend for mature skin types. Using fingertips apply to facial areas and massage into skin once per evening, allowing it to absorb into the skin. Apply directly after the A&M Eye Recovery Therapy. Palmitoyl Pentapeptide-4: Stimulates the skins fibroblasts to rebuild the extra-cellular matrix, including the synthesis of Collagen I and Collagen IV, fibronectin and of Glycosaminoglycans. It also stimulates the production of dermal matrix (Collagen I & III) resulting in a significant reduction of wrinkles and fine lines of the skin. Addressing the multiple problems of sun and age damaged skin, the Intensive Clarifying Facial Cream + III is a glycolic acid based moisturizer featuring three potent skin lighteners; Kojic Acid, Licorice, and Hydro- quinone (2%), which quickly & effectively treat hyperpigmentation & discolorations. Because of how well it protects the skins’ collagen fibers, ascorbic acid based Vitamin C is widely considered one of the most effective antioxidants for skin rejuvenation & revitalization. The 20% Vitamin C Lightening drops combine a potent concentration of ascorbic acid with aloe, green tea leaf extract, and mushroom extract. 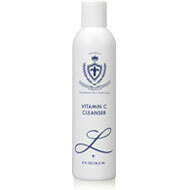 *Also available is our original Vitamin C Serum, containing a milder blend of ascorbic acid (14%). Addressing the multiple problems of sun and age damaged skin, the Intensive Clarifying Facial Cream + III moisturizer combines three powerful lightening. Agents: Hydroquinone, Kojic Acid, & Licorice, with Alpha Lipoic Acid, Vitamin C, & Co-enzyme Q10, minimizing fine lines, evening skin tone, and naturally exfoliating the outer layer of the skin while providing a 15 sun protection factor (SPF). Smooth a pearl sized drop onto the face once or twice daily. Avoid eye area. If used during the day, apply additional sun protection if skin is in contact with the sun for an extended period (twenty minutes or more). Ascorbic acid based Vitamin C is widely considered one of the most effective antioxidants for rejuvenating mature skin due to its ability to protect the skins’ collagen fibers, and for its ability to help inhibit melanin production, creating a lightening effect to the skin. The 20% Vitamin C Lightening Drops combine a potent concentration of ascorbic acid with aloe, green tea extract, and an exotic mushroom extract (Tricholoma Matsutake Singer) for additional lightening. 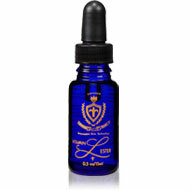 On clean, dry skin apply four to five drops directly onto the face once daily. Avoid the eye area. Thoroughly wash hands after use. Though a light tingling sensation is normal, if irritation (redness) results after application, discontinue or reduce the frequency of use of the product. A gentle cleansing formula specifically for dry skin, the Creamy Facial Cleanser contains natural extracts such as orange blossom, chamomile, lavender, cucumber, and rosebud that help to heal and moisturize vitamin depleted skin. Designed for skin conditioning and age management skin types, the Vitamin C Cleanser is a refreshing, antioxidant fortified cleansing lotion that works to strengthen and firm the skin while removing dirt and other impurities from the skin. Collagen is often found to be the most powerful product for reducing signs of aging as the active ingredients stimulate the skins natural collagen synthesis, occurring within the cells of the skin. This process promotes cell re-growth, and increases elasticity, which leaves the skin more flexible and firm. Our Collagen is water soluble, and plant derived. A highly effective moisturizing cream formulated with a blend of glycolic acid and antioxidants (Alpha Lipoic Acid, Co-Q10, & Vitamin C) to restore texture and clarity, giving a renewed radiance to the skin. Vitamin A has been clinically proven to visibly reduce the appearance of fine lines and wrinkles, as well as increase the skin’s firmness. 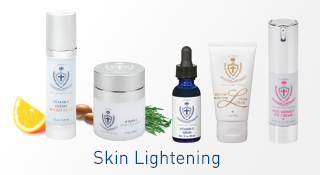 The following age management products aid in lightening the skin, helping to treat hyperpigmentation, or dark patches of skin typically caused by excess sun exposure, inflammation, and other skin conditions such as acne. The Creamy Facial Cleanser contains milk powder and other soothing ingredients that leaves the skin extra soft and smooth. 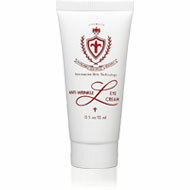 It may be used on all skin types, but is especially appealing for sensitive, and/or dry skin. Apply to face with a cottonball to remove makeup or impurities. It can also be applied by emulsifying in the palm of the hand, then gently massage onto skin using fingertips. Rinse with lukewarm water and dry with soft towel, or leave on the skin for an additional moisturizing effect. Emulsify cleanser with lukewarm water, and gently massage onto the skin. Rinse thoroughly and dry with a soft towel. Working to restore the skin’s natural glow and suppleness while reducing the signs of aging, the Collagen Copper Activating Complex contains an exclusive formula that works to reconstruct the collagen in human skin allowing skin cells to proliferate and restore healthy tissues. Creams and lotions can moisturize or exfoliate the surface of the skin, but struggle to diminish the lines or wrinkles that are caused by the reduction and alteration of underlying collagen support. Key ingredients, such as Hydrocotyl and Coneflower Extract improve and maintain the skins’ suppleness by increasing superficial and integral skin firmness and density. 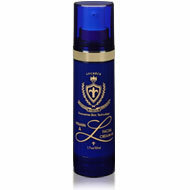 Best suited for skin conditioning, and/or mild age management regimens. 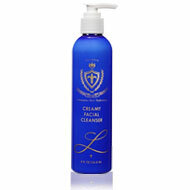 Apply a liberal amount on clean, dry face once or twice daily by massaging into the skin with fingertips. May be used around the eye area. 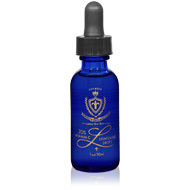 Copper Activating Complex - Stimulates collagen formation. Hydrocotyl & Echinacea Purpurea Extracts - Firming agent. Yeast Pollysaccharides - Tightening, anti-oxidant. Decarboxy Carnosine HCL - Prevents oxidative degradation of the skin. Containing a glycolic acid based formula with anti-oxidants (ascorbic acid, alpha lipoic acid, & co-enzyme q10), and 15 SPF sunscreen, the Regenerative Facial Cream + III is a classic multi-beneficial moisturizer for mature skin types. Apply a pearl sized drop onto face and massage into skin with fingertips once or twice daily. For day use, limit sun exposure, or apply additional sunblock if in contact with the sun for any prolonged period of (20) minutes or more. Blending the purest form of Vitamin A with fine ingredients such as Vitamin C Ester, DMAE, and numerous Botanical Extracts, the Vitamin A Facial Cream + III presents a potent combination of age-defying ingredients that work deep within the skins layers where wrinkles develop. Apply a pearl sized drop onto the face at the end of your evening regimen. For night use only. Recommended usage: Apply after the Nano-Peptide B5 Complex, and A&M Recovery Therapy, as the final step in night regimens for age management. Due to the retinol content this product should not be used by pregnant or lactating women.